As someone who loves photographing the night moods, Halloween is a rare treat for me. Having just finished a night photography project, letting imagination wander in the quiet streets of Santa Monica, I have now a chance to witness how "the veil separating the worlds" becomes transparent and this quiet and beautiful neighborhood turns into a modern rendition of the underworld. I walk around with the camera, taking in the mood and colors, peeking through the veils. Light shining through cobwebs turns into abstract images depicting the land of the ghosts. A world filled with mystery and magic. It is this veil between the worlds I am looking for whenever I photograph. The spirit and the story hiding beyond what the eye can see. No better time for this than Hallows' Eve. My trick & treats. How are ideas born? Where do they come from? What translates objects into new concepts? A few weeks ago, I visited an inspiring exhibit at LACMA - Frank Gehry. To say his work is inspiring, is an understatement. The funny thing is that it is irrelevant whether I would like to live in such a house (I get a bit dizzy from looking at his buildings ...), or if his original inspirations (crumbled paper ..) sound exciting. His thought process and the way the concept was translated into glass and metal, triggered something in me. How about showing these building is different way. Near some of the building models, were videos showing the real buildings in their environment. In some cases the videos included interior shots. How about combining the models (physical manifestation of idea) with shots from the videos ( a virtual representation of reality)? I wonder what would Frank Gehry say of these. Thank you Mr. Gehry for being an inspiration. if you happen to be in Los Angeles - run and see it. Playing with the camera. I do not want to capture the magnificence of the beach. It's the ripples of light, the salty air, the sound of the waves, the continuous movement that I am after. Hundreds of images of the beach, and I am still looking for the right way to photograph it. Ironically, it is when I am starting to play and let it happen that some of the barriers break down. While the images are not at the quality of the D750, Fufu comes with some unexpected benefits. It is so light, silent and its automatic mode works so well, that it made me regress to the age of 5, experimenting and having fun rather than being serious about the images I take. Yesterday, in a very uncharacteristic rainy weather (rain in LA in July??? ), we drove to LACMA museum to listen to some Jazz and see a photography exhibit. My husband drives, while I sit next to him, and amuse myself with photographing on the go, through the rainy windows. Than, as Fufu is weather proof, I do not hesitate to step outside in the rain, and photograph a lone table and its reflection. A tiny bird aspiring for stardom landed under the chair - just in time. At the photography exhibit, I saw for the first time an authentic photograph by Henri Cartier-Bresson. The one who coined the term 'the decisive moment'. The one who said the camera is an instrument of spontaneity. I never agreed with him more. I know the beach at Netanya for more than 40 years. That's where I spent time as a young girl. Where I studied for high school exams. It's the view my dad saw from his apartments' window until his last days. The building is still here. His body is not, but for me his spirit still looks at me when I am on this beach. Now, before leaving, I went to say goodbye to the beach. With the camera. Trying to capture the present and the past. And who knows, I might have captured a glimpse of the future as well. April 21st, 2015.Our last night in Kadoyde, Japan. To celebrate the end of our stay, Kobayashi, our host prepares yet another surprise. 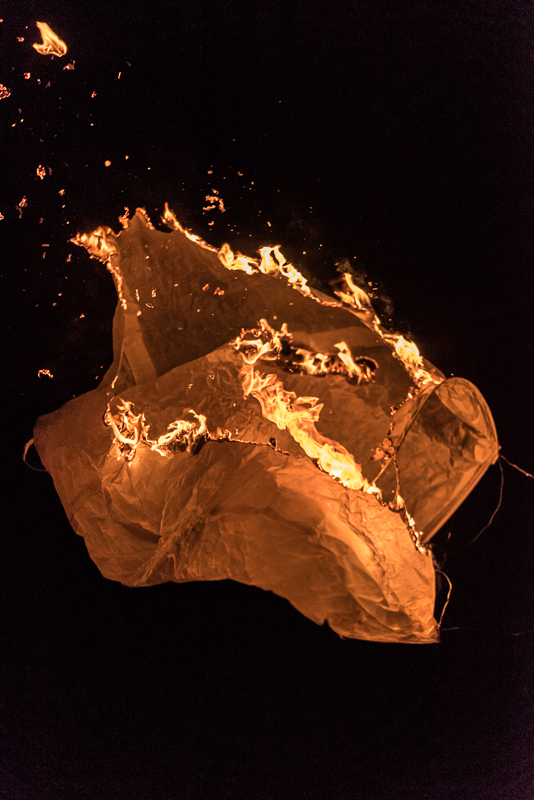 A sky lantern. He holds the large paper lantern while someone lit the fire beneath it. For a few seconds, all seems well. Then slowly, the lantern catches fire, and its shape disappears while its spirit emerges. This reminded me of Constantin Brancusi, the Romanian sculptor and his view on capturing the essence of things. "When you see a fish you don't think of its scales, do you? You think of its speed, its floating, flashing body seen through the water... If I made fins and eyes and scales, I would arrest its movement, give a pattern or shape of reality. I want just the flash of its spirit"
And if it's the essence of the fire dance we are after, there is no need to look further than de Falla's 'Ritual fire dance' who does it with sounds rather than images. One of the things I like most about photography is that it sits right at the junction between science and art. A bridge between logic and emotion. The image above is not a result of Photoshop. This is pure in-camera photography. Proof that the camera doesn't 'know' what it records, it just records light. It is up to us to control what is lighted and capture it in the frame. Nothing new here, right? This week I started to experiment with controlled light (using the most basic flashlight, the 3$ type...) and long exposure. The results, can probably be much improved, but the potential is amazing. To literally show the invisible. Explore realms our eye can not see, but the lens can help us create. And the best of all - a way to really have fun. Who needs Photoshop when it's raining? When it rains, it pours ....for the last 2 days it has been raining non stop. The back yard, which used to be a lawn is now a puddle. Most of the time sitting quietly at home, but now it's Friday morning, when I always go buy sweet treats at a local bakery. Sneaked out of the house when rain seemed to take a rest. 2 minutes later, still sitting in the car in the parking lot near the bakery all hell broke loose. The only thing to do was to take my phone out and take pictures. Through the moving raindrops on my cars windshield. I started photographing from a very good reason. As a goldsmith, I wanted to sell my jewelry online and I needed good photos. From there the road to photographing as a creative outlet was relatively short. Much shorter than the road to define to myself what is it that I really love to photograph and develop a personal signature style. Why did I think of it now? Because since I remember myself I love gardens, and English rose gardens are at the top of my favorite ones. The white garden in Sissinghurst is something to be seen to be believed. There is a quality of fairy tale fantasy that can not be conveyed in words. For the last 2 days I have been photographing a single rose in the garden. A pale pink one. But as beautiful as this rose is, taking a documentary shot of it did not express at all the sensuality of its petals. The delicacy and fragility of it. The impermanence - tomorrow it will start wilting, in a few days it will not be here at all. But now, today, it is just perfect. The essence of a rose. This is what I want to photograph. Pure morning light. Streaming between the leaves in my front yard. Reminded me of my physics classes long ago. About light being both waves and particles. The thing that enables us to see. Rather than painting with light ( the actual meaning of photography ) this picture is about the unbelievable beauty of light itself. Suspended in space, partly revealed, partly concealed. Radiating. Mysterious. Magical. Dancing between the leaves. Life is funny sometimes. Moves in spiraling cycles. I was thinking today that it is as if I look at myself through the lens using the manual focus. Unlike the auto-focus where you point at what you want and the camera decides on the optimal focus, the manual focus requires to turn the dial until you find the right focal distance. Sometimes, in the process, you decide to completely change what the picture is about. You keep turning the dial until the frame is perfect. Then you take the picture. This looks a lot like my personal journey in photography. Starting from a fuzzy concept - nature. Turn the focus dial a bit, and stopping at nature fine art. An additional tiny shift of the dial and now focusing closer on nature fine art where reality border on something that transcends reality. The picture starts looking clearer. more focus tweaks - reflections and post processing techniques that help blur the line between real and beyond. I take the picture, and it's exactly there. Between physical and mystical. An accurate reflection of where my art is right now. When I look at the picture (the one below) it reminds me of the dark paintings of Rembrandt. I look for him on the web, and surely enough the right quote appears. As if he is talking directly to me. Advice from a master. 'You can't depend on your eyes when your imagination is our of focus' said Mark Twain. Food for thought isn't it? Especially when I can definitely let my imagination fly when the actual view is out of focus. I've seen many paintings and pictures of wonderful views seen through the window. I thought about them today, when it started to rain and I raised my eyes to the window in front of me. i was sitting in a room that is half underground, the window is at grass level. An unused bicycle leans on the wall, obstructing most of the view. Never thought of this as a 'room with a view'. Take another look at the picture. What do you see? A giant snail with a green hat? Trying to escape a chasing cloud? Marble columns? Does it really matter that these are the outlines of a bicycle and a green patch of grass? Who said this room does not have a view?